EASY tips from The Lunch Lady to make entertaining this holiday season stress-free and FUN for EVERYONE!!! TORONTO, Ontario (November 18, 2015), — Just in time for the holidays, The Lunch Lady www.thelunchlady.ca , introduces a NEW fresh berry smoothie and also a improved signature marinara sauce, the basis for a healthier holiday party for kids! The Lunch Lady has been delivering healthy, affordable, nut/allergy aware, lunches to hundreds of Canadian schools for over 20 years. Tips you can feel better about, from the lunch lady, for a truly healthy and happy holiday celebration. Learn how-to incorporate these Lunch Lady favorites into your holiday festivities. Don’t get caught up in the holiday frenzy and plan to feed your kids healthier this year. 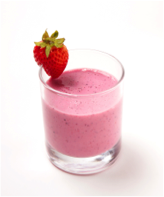 Start with a Frosty smoothie – Little ones love cocktails too! Greet them with a holiday smoothie. Serve it in a fun holiday inspired glass, garnish with berries and serve with a straw. For the older kiddies, serve in a shot glass and garnish with a sprig of mint – kiddy shooter shooters all around. Place all ingredients in blender, puree until smooth and serve. Holiday Tip #1: Avoid holiday meltdowns and place your smoothie in a lidded plastic cup, freeze partially, and pop in your cooler bag for those long road trips to see the relatives. Serve Rudolph’s Red Reindeer Pasta – Kids love pasta! Make it festive with their favourite holiday pasta and top it with our NEW holiday sauce. Sautee onion and garlic with oil. Add tomatoes, tomato paste, and water. Gradually add basil, sugar and salt to taste. Simmer for 1/2 hour. Puree in a blender or use an immersion blender until smooth or leave a little chunky! *** Nutrition Benefit: The lunch Lady’s recipe has only 167 mg and wait till you taste it! Compare a single slice of pizza (650mg salt) or even a simple jar of prepared pasta sauce (480 mg of sodium in ½ cup). Holiday tip #2 –No Santa threats necessary! This versatile sauce is a holiday must have – freeze leftovers or morph it into a hearty soup or stew. Otherwise, simply add more basil, garlic or even hot sauce depending on your particular holiday soiree! Dinner will magically disappear. Go all out and serve with some broccoli trees or green bean branches to get that holiday feeling. Don’t forget the Festive Crunch! Bring it out to buy yourself a few more minutes of adult time or give-a-way as a party favour to help get the little ones out the door. Mix ingredients together and pour into individual candy bags. Tie with red and green ribbons if taking to a party or putting in stockings. Nutrition Benefit #3 – This is a low fat snack with benefits – The basic recipe has 2.5 gm of fiber [12% of your daily requirement] and 8% of your daily iron. Worried about nut allegies? This recipe is peanuts and tree nuts free! Holiday Tip #3 –Who does not like to nibble? Easier than baking cookies, this treat is kid tested, travels well and satisfies cravings for something sweet and salty – also perfect for chocolate loving Moms! The Lunch Lady has grown through a network of dedicated franchise partners who support healthier school food environments in 4 provinces – Ontario – Manitoba – Alberta and British Columbia. It was founded by Ruthie Burd, in 1993. Ruthie was intrigued to learn there was a lack of cafeterias in elementary schools and also parents found making lunches a real chore! Ruthie believes in making a healthier, affordable lunch, which can be delivered to all Canadian school age children. She believes it is possible to create healthier versions of kid friendly favourites that kids will not just eat but enjoy eating!